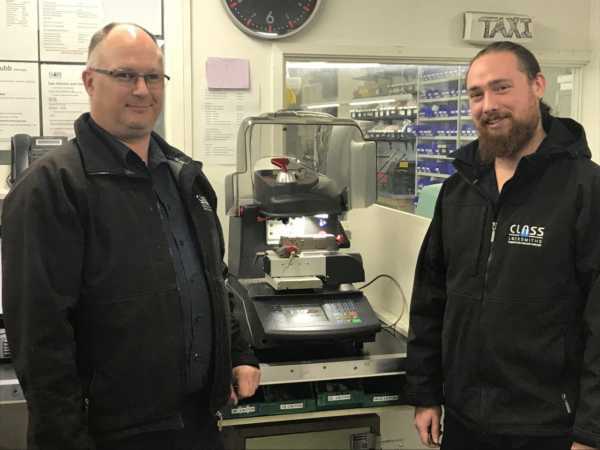 Jim and Colin proud as punch with our new state of the art automotive key cutting equipment – the Silca Triax Pro. Customer service is the key (pardon the pun). Therefore we have enhanced our capability to cut automotive keys which is great for our customers and our business. It is also a great workhorse for our locksmiths. It improves our service to our customers thus also improving our job satisfaction. In addition to automotive key cutting we provide a full range of automotive locksmith services. We can help customers with most of their automotive locksmith problems. This entry was posted in Automotive, Front Page, Latest News, Staff and tagged 24/7 locksmith, Automotive Locksmith, car keys, car locksmith, key cutting.